You can spend all day long on the internet scouring for jobs in the marijuana industry, but odds are the best way to find one is by attending marijuana job fairs. Just like the college job fairs of yore, cannabis-themed events like these are a great opportunity for candidates to make connections and take advantage of open job applications. One of the great aspects of marijuana job fairs is the diversity of businesses represented. Job seekers have opportunities to connect with a variety of industry leading professionals across the cannabis job sector. Everything from cannabis dispensaries and cultivation operations to marijuana edible production kitchens and paraphernalia and apparel manufacturers are likely to have a booth at marijuana job fairs. It is in settings like these where the industry is truly supported, with representatives from across the country appearing to make connections and strengthen their presence. The mix of entry level marijuana jobs like budtending and bookkeeping with more specialized careers like cultivation demonstrate the range of hiring needs experienced by the industry as a whole. In order to provide a better picture of of the offerings of marijuana job fears, this article will attempt to demystify the aforementioned five careers. Budtenders carry much of the cannabis industry’s mainstream clout. Appearing in more regions throughout the U.S., especially on the west coast, budtenders facilitate the sale of legal cannabis products and paraphernalia to customers and patients. The novelty of the job title itself is enough to excite driven stoners and customer service workers to pursue budtending as the next step in their career. Budtenders maintain a lot of different responsibilities in this newly legal market, but none are more important than serving and assisting customers with the selection of merchandise to fit their individual needs. Unlike bartenders, budtenders concern themselves not only with the taste and “high” of products, but the medical implications as well. When attending marijuana job fairs for budtender jobs, it may seem overwhelming how large the pool of applicants for each job is, but there are some definite ways to garner some attention to your application. For starters, being personable and having a conversation with the dispensary you’re applying for is a great way to put a face to your name and show that you are able to engage with strangers in a kind, comfortable way. When it comes to your application itself, be sure to highlight any direct customer service experience. Contrary to some belief, having experience working with cannabis isn’t necessarily the most sought after trait in job applicants. Budtenders receive training to bring them up to speed on the all important compliance measures that keep a dispensary from being shut down. It’s important that applicants have developed cannabis product knowledge, as well as a strong fluency with their state’s regulations on cannabis distribution. Dispensary managers are integral players in moving the cannabis industry out from under the shroud of stigma and into the mainstream. Managers oversee dispensary operations and are in charge of training and supervising budtenders, receptionists and other dispensary staff. In terms of compliance measures, it is predominantly the manager’s responsibility to ensure that all employees are following the rules perfectly. In addition to managing employees, dispensary managers often perform double duty as budtenders and are responsible for taking inventory and ordering products. Dispensary management jobs act as a great springboard between entry level marijuana jobs and advanced careers. The position comes with a certain amount of stress, especially since dispensaries are subject to constant government oversight. When applying to be a dispensary manager at marijuana job fairs, applicants must be able to provide proof of past experiences working in management, with marijuana, or both. Unlike budtending, dispensary management is a position that almost always requires some supervisory prerequisites. While some dispensaries promote from within, hiring from the outside ensures that employers are looking for the most qualified and passionate individuals around. There’s a lot of talk in the cannabis industry about the cultivation process and dispensary sales, but many don’t consider how products make it from the farm or lab to the counter. This is where sales representatives come in. Sales reps work for cannabis production facilities or companies that sell products wholesale to pot shops, so they can then be sold to customers. A large part of being a cannabis sales rep or brand ambassador is traveling. The job involves making connections with businesses and convincing owners and managers that the products they’re selling are the best for that business. Sales reps are sometimes asked to perform product demonstrations at trade shows or even marijuana jobs fairs to bring brand awareness to their company. This position is predominantly about sales, so it helps to have a strong background in that field. These individuals must be comfortable leading a sales pitch and thinking on their feet depending on the conditions of their client and the business they are representing. Sales reps are the primary avenue through which wholesale cannabis production facilities meet their fiscal goals, putting a significant amount of pressure on the position. On the positive side, sales representatives are frequently compensated with base pay plus commission, incentivizing employees to invest time and energy in their sales. For outgoing candidates, being a sales rep can be the predominant goal of attending marijuana job fairs as the position perfectly combines strong sales sensibilities and a love of cannabis. The dream job of many cannabis industry job candidates is growing. Full-time marijuana cultivation jobs can be hard to come by, but they offer some of the most valuable, transferable skills and experience of any marijuana job. Depending on the size and makeup of the grow operation, cultivation staff may consist of a lead or master grower who runs the operation with support from assistant growers. The growing process is a high intensity one that comes stocked with many variables that affect the outcome of the crop. Growers must decide whether the operation will take place inside or outdoors, as well as if they will use soil or hydroponics to facilitate plant growth. Additional care must be taken when formulating plans for light exposure, humidity, feeding, poison and pest control and so much more. Being a cultivator can come with a hefty personal payout, but it’s not without hard work. Growing is a time consuming job that may involve a lot of “off hours” work, since the plants don’t operate on the same time constraints as the average worker. Securing a job as an assistant grower is a great step toward leading your own operation one day. Assistant growers either have past experience working in cultivation, budtending or even marijuana trimming jobs. Unless you have connections in the industry, grow assistants usually have some sort of base level experience working with weed. Even though assistants are supervised, the hope is that they can carry out their daily tasks and upkeep with precision and organization. Becoming a master grower is somewhat of grand pursuit. These folks work their way up the ranks season after season until they are confident and experienced enough to lead an operation and produce a successful crop. Cannabis bookkeepers and accountants are some of the industry’s unsung heroes. The difference between an effective bookkeeper and one in over their head will become clear all too quickly in this stringently regulated industry. Bookkeepers are responsible for navigating the convoluted, often fluctuating cannabis regulations that affect legal businesses. Especially since cannabis is still an almost exclusively cash-based industry, accounting becomes a complicated endeavor with a lot of room for error if the bookkeeper isn’t organized. In addition to being skilled mathematicians and methodized administrators, employers at marijuana job fairs are looking for bookkeepers with a refined knowledge of cannabis legislation, history and products. One of the industry’s biggest growing pains comes in the form of audits. Given the suspicion historically associated with the marijuana, individual cannabusinesses are constantly at the whim of the law and aren’t awarded many chances to make mistakes. This is where having a knowledgeable bookkeeper is key: while there is no guarantee a business won’t receive government intervention, a well maintained payroll is a good way to keep the company’s ducks in a row. Finding a job in the cannabis industry is attractive to newcomers and seasoned vets, alike. The promise of this business lies in its desire to be as inclusive and transparent as possible. The jobs detailed above represent some of the most available positions found at marijuana job fairs, but there are plenty more where that came from. As the demand for substances like cannabis concentrates and edibles spikes, more positions for edibles chefs and cannabis extraction technician jobs are cropping up, leading the way for high paying careers in the cannabusiness. 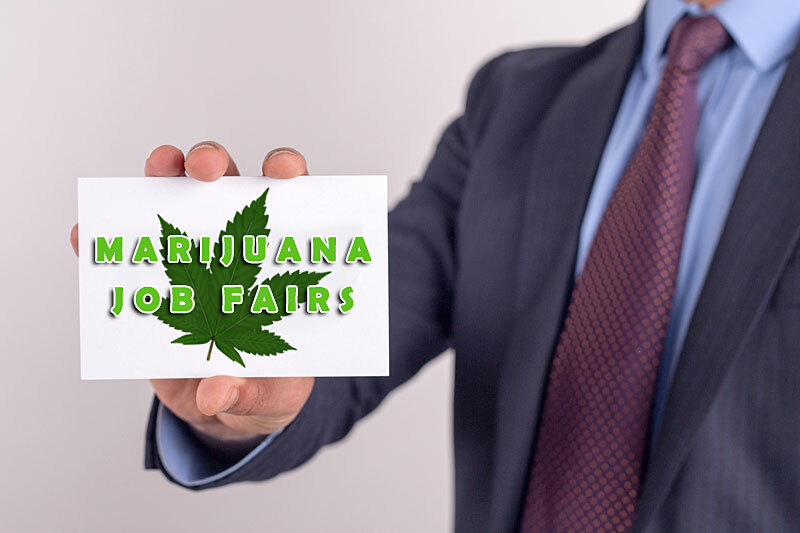 Whatever job you’re looking for, marijuana job fairs are amazing opportunities to connect with like minded individuals and get your name out there.